DC Universe Online or DCUO is an MMORPG by Sony Online Entertainment Austin set in the DC Universe. Sony Online Entertainment's stated goal is to make a different kind of MMORPG, with The Incredible Hulk: Ultimate Destruction cited as one of the main inspirations for gameplay. SOE is working to make DC Universe Online more interactive than standard MMORPGs, while trying to keep their key elements, which include a leveling system, raid instances, endgame progression and inventories. The world is mainly shared, public space instead of heroes or villains owning territory. The public space features dynamically-generated content designed for both hero and villain player characters (uniquely created by the player, who cannot choose DCU stalwarts). 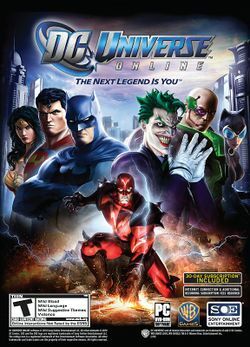 DC Universe Online is set in the present day, but the opening cinematic sequence takes place in a gritty, war-torn future depicting a final battle between the world's greatest heroes and villains. This battle takes place in the ruins of Metropolis, and features the deaths of several well-known DC Comics characters. The battle culminates with the death of Superman at the hands of Lex Luthor. Luthor stands back to proclaim his victory, only to see Brainiac's warfleet fill the skies. The scene then shifts to the present-day Justice League Watchtower, where the future Luthor is telling the story to the present-day Superman, Batman, and Wonder Woman. Luthor explains that the only reason he was able to kill Superman was that Brainiac had been slowly stealing power from the Earth's heroes over time. Brainiac intended to use the stolen energy to create an army of metahumans under his control, to facilitate his conquest of Earth. This plan was discarded, because Luthor and his allies were able to destroy the Justice League. Luthor explains that he was the only survivor of the war, and could do nothing to resist Brainiac's subjugation of the planet. Luthor explains that he was able to steal the stolen energy from Brainiac's mother ship in the form of "exobytes", nanobot-sized devices that can project the energy into a living host. Luthor has traveled into his past to release the exobytes into the atmosphere of present-day Earth. The heroes are outraged, but Luthor explains that because he has done this, soon thousands of new metahumans will be created from ordinary humans. He implores the Justice League to find and train these new metahumans, because Brainiac is coming, and the Earth must be ready to succeed where Luthor has failed. This page was last edited on 9 July 2016, at 20:31. This page has been accessed 102,230 times.